Do you notice the mustard seed in the center of the cross? Wouldn’t it be wonderful to have the same daily Scripture readings leading up to Easter? I was like a giddy schoolgirl the day that one of the elder’s wives at our sending church told me she’d written an advent devotion for the 40 days leading to Easter Sunday. She, too, was deeply impacted through using the Advent Jesse Tree at Christmas and wanted a similar devotion for Easter. That conversation with my friend, Faye, was 2 years ago. For the last 2 years, our family has used and loved her Lenten Advent devotion, The Word Became Flesh. The devotion starts with the birth of Christ and goes through his life, ministry, crucifixion and resurrection. It is such a sweet journey through the life of Christ during the 40 days leading up to Easter. Always encouraging and convicting is the exercise of reflecting on His miracles, compassion when relating to the sinners He came to save, great love that He possessed for His Father, and perfect obedience. Of course, anytime we’re spending time in the Bible, we will be drawn deeper into our love for and relationship to God. The Word Became Flesh will help you do that this year leading up to Easter. Don’t you love this little piggy ornament?!?!? Bible trivia here. Which New Testament parable would be represented by this cute little piggy? 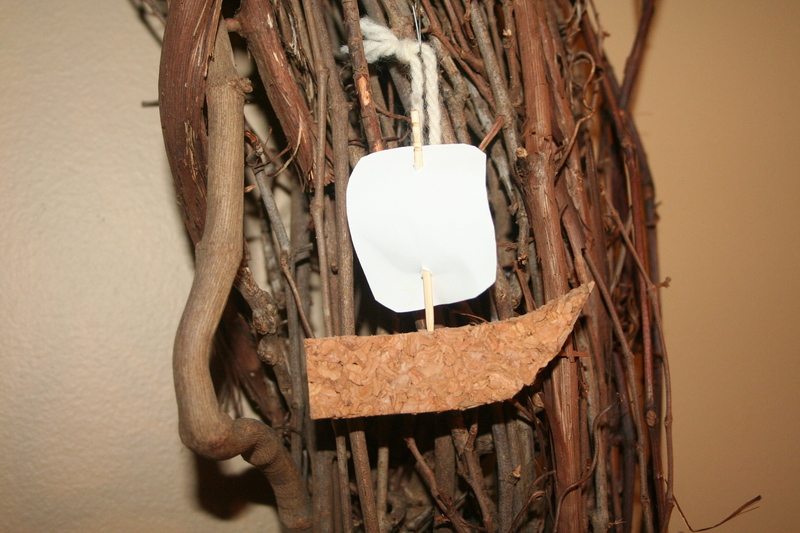 This cute little boat made of cork board, a tooth pick and paper is for the story of Jesus calming the storm at sea. If you’re not super crafty or don’t have time to organize an Ornament Swap, no worries! My friend Faye, well, God’s given her amazing talent! Faye is an amazing artist, specifically a brilliant painter. Not only did she beautifully pen the words to each devotion, her hands brilliantly sketched amazing pictures to go along with the day’s devotion. Here are two examples from the book. These pictures below are for the story of Zaccheus (sycamore leaf) and the story of the Prodigal Son. You can photocopy the pictures, mount them on cardstock or scrapbook paper, and your set of 40 ornaments is done! I love the structure of each day’s devotion. Faye calls this a “devotion guide” rather than a “devotional.” For each day, there is a passage to read, a list of suggested songs to sing, 5 or 6 questions to answer together after you read the passage, and a prayer. Faye truly laid this out as a guide for you, not her own thoughts written down for you to take in and believe. Each day is structured in more of an inductive style so that you can read the passage and discuss the questions together. She gently guides you into the focus for the day by leading you to the Word, and then, she leaves you at the Word. This creates room for the Holy Spirit to enter in, instruct, convict, and draw you nearer to your Father God. I love that! I love how I’ve seen the Holy Spirit draw me in as we’ve read the passage together. I love how this process of reading, digging deeper into the Word for ourselves is being experienced and learned by my sons. I love, most of all, the 40 day focused time in the Word, preparing my heart, soul, mind for Easter (and my family’s too!). I will confess that the thought of 40 days was daunting and overwhelming the first year we did this as a family. I’m a perfectionist, so I hate to not perfectly follow a plan. Thankfully, the Lord has helped me shed a great deal of my perfectionist trappings through our church planting experience. So, now if we miss a day, I just tell myself, “Well, we’ll start again tomorrow and won’t quit the whole thing!” (A HUGE step for me!) So, don’t freak out that it’s 40 days. Just start it and take it one day at a time. (This is my pep talk for all perfectionists reading this post!). Honestly, once we started the 40 day journey and got into it after the first week or so, I saw the spiritual fruit in my own life as a result of the daily, focused time in the Word. I didn’t mind it after all and was actually quite saddened to see the 40 days end. Yes, I want one!!! Let me know how to pay you. So glad about this. I tell Jon every year how Easter is really my FAVORITE…I’m always trying to create my own readings, etc. (like an Advent reading) and having us listen to music to go along with our reading. This will be so helpful. Thanks for sharing. Also, we are LOVING CC. It’s going well and seems really perfect for our family. I’m still getting in the groove of only having three teaching school days at home because we are still in our Co-op on Fridays, which we love! I think it’s good for me to have this much going on because it keeps me on my toes in getting done what I know I have to do. Ellie Nelson emailed me wanting to know some about it and I told her she might want to contact you, too. I also love that some of our tutors are using your stuff from your blog. My girls are proud to say that it’s stuff from their mama’s friend! J What a blessing your blog is!!! you’re not going to believe this!!! i was JUST about to email you to see if you would be interested in this!! i will email you the info about how to order it. 🙂 so so glad you’re loving CC!!! i knew you would!! 🙂 🙂 awwww, so honored and humbled to hear that my little resources are helpful and encouraging. 🙂 much love!! Hey Suzanne, I would love an Easter Advent Calendar! Please let me know what I need to do to order one. I have been doing CC this year with my oldest son but I am not apart of a co op, there was not one available to me, so I have looked at your blog several times to get ideas. Thanks for the time you put into your blog. Shannon!!!!!!!!!!! I have been out of the blogosphere this last week with Spring Break and out of town company. THANK YOU THANK YOU THANK YOU for this wonderful post about how the Lenten Devotion Guide is being used and impacting your family! I can’t wait to share these with my friend, Faye, who wrote the book. This is our 3rd year going through it, and we just love it so much!!! I love spending the 40 days leading up to Easter saturating myself with the stories of Jesus, His ministry, Death and Resurrection. thank you, thank you, thank you for helping to spread the word about the Devotion Guide. I tell my friend, Faye, ALL THE TIME, that she needs to get this published! Thank you for taking the time to share this with me. It was such a joy for me to be able to share it with my blog readers. Thank you for letting me peek in on how it’s impacting your beautiful family! I LOVE, LOVE, LOVE your ornaments! I’m with you, kid-made ornaments are always the best! God’s richest blessings to you this Easter season! I love the CC Community in the blogosphere! Thank you for all of the great things that you share on your blog and CC Connected! 🙂 They’re so helpful!